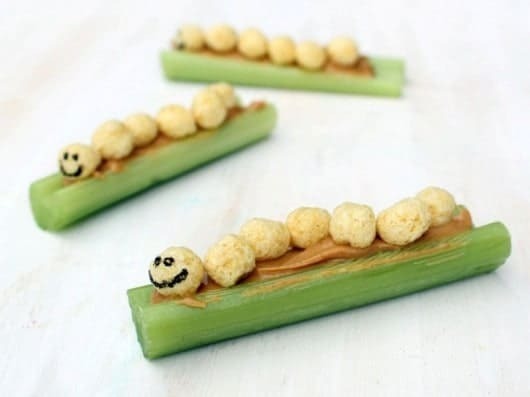 This caterpillar snack for kids turns celery and peanut butter into fun food idea. So, guess what? I have a new gig. 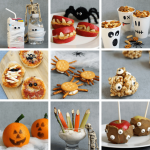 I’m creating fun food for Kix! Don’t worry those of you who worry that I’m doing too much with work and the new baby and the kid and life (mom, I’m looking at you), I’m only coming up with a few ideas a month. But I kind of knew it was right when I was reading the email from my contact at Kix, they of General Mills fame, about the new gig as my daughter was actually eating Kix. Seriously. 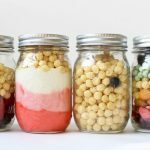 And, I looked at their site, Kix Cereal, wherein you’ll find great ideas for kids’ crafts and recipes, and I thought, “hey, this is a crazy cool site.” So I’m pretty excited. And I already have a few posts under my belt, which I’ll be sharing with you throughout September. First up is an easy one. It’s inspired by my favorite childhood snack and by bugs. 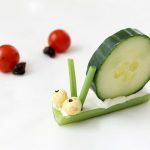 Find the how-tos to make Kix Caterpillars on a Log HERE. oh my gosh… my daughter would just love love love those! 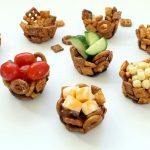 what a super creative little kiddo treat! Congrats on the new gig. The caterpillars are too cute! Congrats on your new collaboration! Congratulations!! Excited for you. And these caterpillars are too stinkin’ cute! I saw them first on pinterest last night and had to repin them. Thanks for sharing and have a great week.